I already spotted Essence's new permanent line *click*, and now my drugstore also put up their new LE called Marble Mania. This LE contains 1 mascara, 3 baked eyeshadows, 2 lipglosses, 1 blush, 4 nail polishes and 1 nail art kit. Here *click* you can find the promo pics on Pinkmelon. The mascara is black and has white and silver swirls in it. It also glitters. A pass for me. The baked eyeshadows are also marbled, and they all have pretty wearable and nice colors. There are testers, so I suggest you try them if the colors look interesting to you. I didn't get one, though. The lipglosses have the marble look, too. They have a metallic-like shimmer and will also be part of the permanent line. I'm not sure if it's these colors exactly, but I'm sure they do have similar ones that are permanent. The nail polishes aren't standard colors, but they're still not unique. They did look nice, but I only got one of them which looked best to me: 01 Raspberry Swirl. 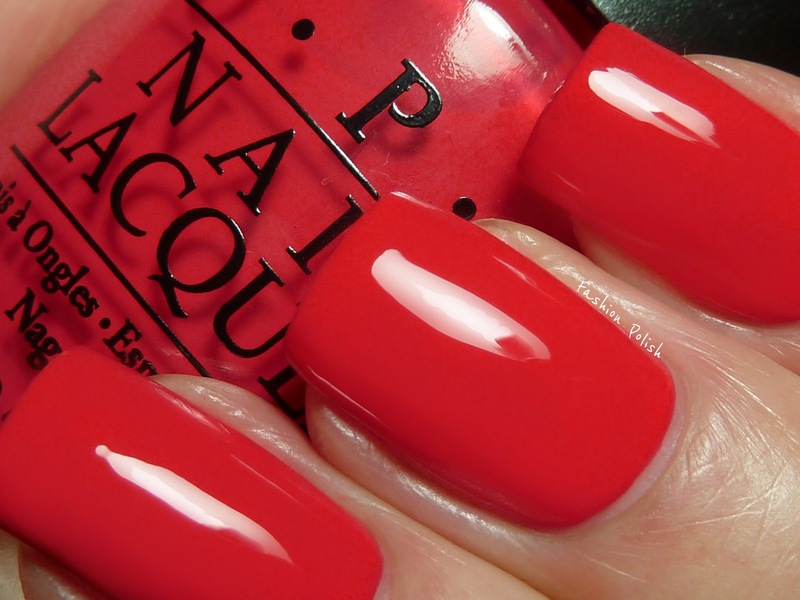 It's a coral red creme polish, and I mainly got it because it reminded me of OPI Red Lights Ahead...Where? from their Holland Collection, *click*. What do you think? Could they be dupes? And last but not least, the Nail Art Kit. It's almost the same like the new permanent Nail Art Designer Set, only the limited one has one sponge less and contains 2 toothpicks. I already got the permanent one, so I didn't have to get this one. What did you get of this LE? Or what do you want from it? I didn't have a look yet to this LE. That nail polish is very pretty but I think I have similar colours. Yes, I'm sure you'd be able to find a dupe for it!